Please note these are the universal size cover that provides general fit to all cars with regular size seats only. If you are looking for exact and perfect fit, you might need to look for custom make cover which cost hundreds of dollars. 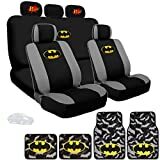 This bundled set includes 2 front seat covers (headrest cover,top and bottom piece in total 6 pieces), rear bucket seat cover and 3 plain headrest covers (top and bottom in total of 5 pieces), 2 headrest covers with classic POW! logo, Floor mats set size: Front: 17″ X 17″, Rear: 13″ X 17″. Features: . Soft stretchable fabric . Unique 2 tone racing design with embroidery Batman logos . 4 Carpet floor mats with nibbed backing . Universal size fits most cars, SUV and trucks with Regular Size Bucket Seat (Will not fit large size captain seat) . Easy to Install .